konkagompa2, originally uploaded by jiulong. 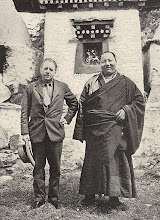 After resting and developing some photographs in Kangding, Joseph Rock returned in an attempt to visit the small monastery of Konka Gompa at the foot of Minya Konka. This was located in an isolated glacier valley over the Tsemi Pass [次梅山口] from the Yulongsi [玉龙西] valley, and was cut off from the outside world from November to April by heavy snows on the pass. 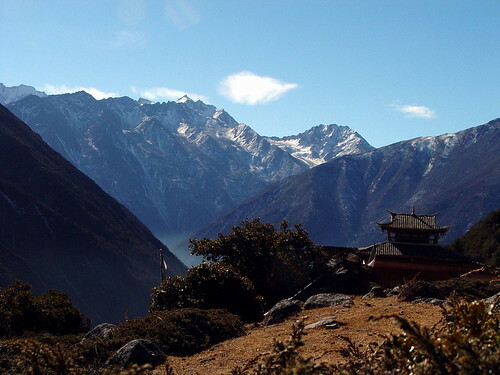 In early June Rock returned to the Yulongsi valley at 13,800 feet and despite heavy snowfalls he attempted to cross the Tsemi pass with some lamas and the treasurer of the monastery to guide and accompany him. He made a successful crossing in snow and passed through the small hamlet of Tsemi before ascending the glacier valley through spruce and birch forest to the secluded and peaceful monastery. It was occupied by just four monks of the Karmapa [red hat] sect and a living buddha. The little monastery was perched on the edge of the ridge, overlooking the tip of the glacier that descended from Minya Konka. A fresco on the wall portrayed the mountain deity Dordjelutru, of which Minya Konka was a physical manifestation. All was quiet and hushed as I lay on my camp cot facing the tomb of the buddha whose room I occupied. Outside the glacier stream roared, the thunder rolled and Dordjelutru staged an electrical display in this weird canyon. I shivered. Here all alone in the presence of a sacred mummy in a hoary lamasery, I listened to this tempest breaking over the icy peak of Minya Konka. Was this the year 1929 or had tiime been set back a thousand years? Did I dream or was it all reality?" His reverie was interupted by the four lamas who came to chant deep bass incantations in his room and throw barley grains over the shrine of the former living buddha. The next day Rock was blessed with clear weather and climbed the 17,2000 foot high ridge behind the monastery to get superb views of the mountain, with just a veil of cloud streaming off the tip of its peak. Back at the temple Rock was shown a sign printed on hempcloth pronouncing that there was no more beautiful spot on earth than Minya Konka, and that one night spent on the mountain was equivalent to ten years spent sitting in meditation and prayer. And one offering of burning juniper here was worth hundreds and thousands of prayers. According to the inscription, Padma Sambhava the Indian founder of the Red Hat buddhist sect pronounced Dordjelutru to be the equal of Shenrezig, who was the Avalokitesvara of India. He also said all the Buddhist deities dwelled within this scared mountain and so anyone gazing upon it would have all their past sins wiped off the slate so they may begin life anew. 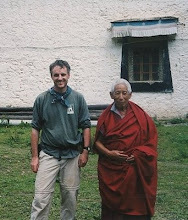 And thus ended Joseph Rock's visit to the Konka Gompa. 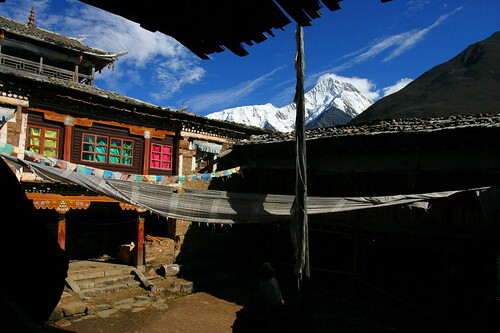 He returned to Muli and then Lijiang via a different route, slightly to the north of the one that he had used to come to Kangding. 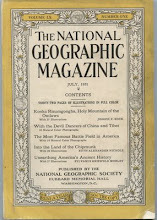 He crossed the Yangtze on rope slides and was then holed up on the island of Nyorophu at Lugu Lake for several weeks, blockaded by the bandits of Konkaling who were on the march in that area. 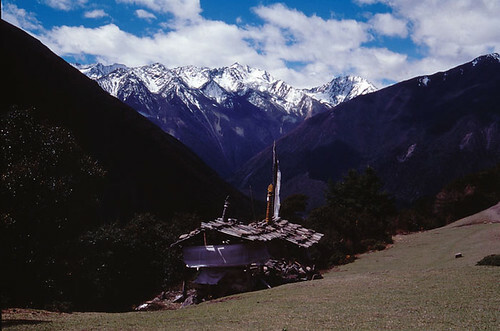 The rebuilt Konka Gompa in 1996. Fresco at the rebuilt Konka Gompa, 1996. A closer view of the monastery. A sketch by Edward Imhof of the monastery from the 1930s. Back of the monastery, looking towards Tsemi. 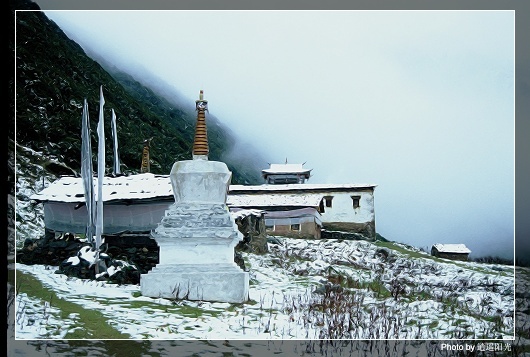 Konka Gompa after a snowfall. Minya Konka from the Gompa.